Healthwatch Dudley Board Meetings – find out more! 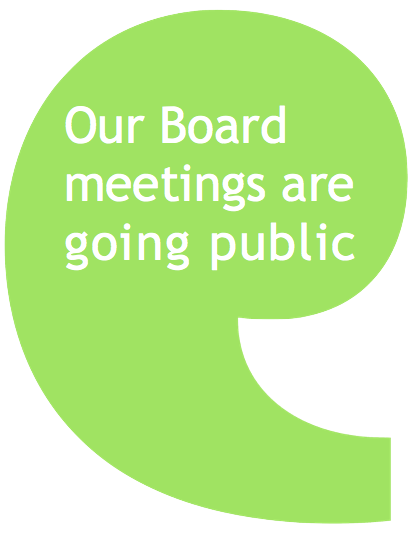 The next Healthwatch Dudley Board Meeting will take place on Monday 11 August 2014 starting at 6.30pm. The meeting will be held in public and all are welcome to attend to observe the Board’s discussions. We will be holding all future Board meetings in public because we think it is important for local people to understand what we do and observe how decisions are made at Board level. In addition to observing the business of the meeting, members of the public have the opportunity to ask questions relating to the work of Healthwatch Dudley. In order to provide a comprehensive response we would prefer questions to be submitted in advance by email to hello@healthwatchwatchdudley.co.uk or by post to Healthwatch Dudley, 7 Albion Street, Brierley Hill, DY5 3EE by the morning of Monday 11th August for discussion at the meeting, however, there will also be an opportunity to ask questions at a set point during the meeting. As your local Healthwatch we are always on hand to answer any questions you have, or to listen to your experiences of health and social care. The team can also be contacted on 03000 111 001. This entry was posted in Uncategorized and tagged Board meetings, discussion, Discussions, Healthwatch Dudley board, Influence, Pam Bradbury, transparrency on August 6, 2014 by Healthwatch Dudley.